Kind of like the commercial says, "Like a good neighbor, State Farm was there!" Insurance is one of those things you hope you never need to use, but if you do, it's sure great to have it. Thanks to that policy, I now have a nice new Nikon D90 D-SLR camera. It isn't too different from my D80 except that it is a higher resolution and it will take movies. One thing I don't like about though, is it came with an 18 - 105mm lens, my old camera had an 18 - 135mm which would zoom in closer (that lens has been discontinued, what was Nikon thinking?!). Oh well, it is just so nice to have a camera in my hands again! :) I had been suffering photography withdrawals! The next excursion was the hike to Sand Cave. It is a HUGE sandstone / congolomerate ov erhang with an enormous "sand box" underneath. The formations in the cliff were interesting to look at, so me were white and orange sandstone, others were curly outcroppings of iron-infused sandstone. As an added treat, there is a lovely waterfall near the base of the cave. Thanks to all the recent rain, it was fl owing nicely. A large group of Boy Scouts were hiking there that day, had it been warmer, I'm sure there would have been a lot of wet boys! :) Rod brought out his campstove here and we enjoyed a hot bowl of Chicken Noodle Soup. Here, Terri is savoring her bowl. Of course, with all the rain, there was a nice showing of mushroom s, puffballs and lichens. 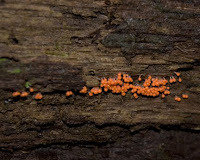 My favorite was the beautiful orange slime mold (yes, I did say "beautiful"!) I found growing on a log. I enjoyed showing to some of the other hikers, they were surprised to see how pretty it is! As best I can tell, this is Insect-egg Slime Mold (Leocarpus fragilis).